A well-composed social media marketing strategy can have a tremendous impact on your bottom line. There are 2.8 billion active social media users worldwide. That’s a huge potential for creating touch points with your audience, clients, and prospects. However, there have come up so many new social networks and media, that it becomes more and more difficult to keep up with the ever-growing pace of the social web. An omnichannel presence on multiple social platforms is a Herculean task for everyone, working with social media. But if you plan your social media marketing wisely you can make your social media activities and campaigns more effective and successful. Your social media marketing strategy does not start or end with Facebook and Twitter. The social media world is very diversified and highly specialized. Take a look beyond the big and general networks and consider niche sites and special interest communities. With turning towards a more specific community your content is much more likely to catch attention. 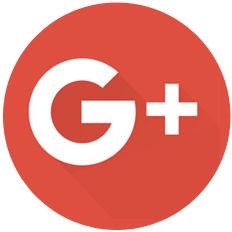 Note: You think Google+ is dead? Google+ also has more than 3 billion registered users, and 4-6 million are quite active. So, most of your audience will most likely have a Google+ account. But above all, active profiles at Google+ have an influence on the ranking in the Google search engine. And take a special look at Google My Business to push your content, posts, and campaigns with Google Posts directly to the top of the search results. Google My Business has been surprisingly underutilized by businesses and agencies. However, with many new features, Google My Business has grown from a simple business listing to a multipurpose service for businesses. Don’t miss this great and free opportunity to share your content and engage with people who find your business in Google search. Once you have selected your choice of networks for connecting with your audience, collect your followers. Turn your website visitors and also your existing customer base into followers. Make it easy for your website visitors and subscribers to follow you on your social channels. Make it also easy for them to share your content and images to their communities. Place social media buttons and icons to follow, like, share and comment on all posts and content on your website, on your blog and in your e-mails and newsletters to link to your social media channels. Placing social media follow buttons on your site and in your emails, can increase the number of followers on your social media profiles and pages. Add social media follow buttons for your social channels at the top of your blog or website, in your footer and on your contact page and add a call-to-action: Follow Me. Add social media share buttons and bars at the top and at the bottom of each post or newsletter you are sending out. Also, encourage your readers to share your images. 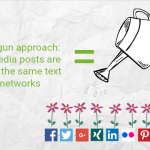 If you have an infographic, place social media share icon on your images as well. Invite your readers to share your images or make it easy to embed your infographics on their blogs and websites by displaying the embed code. Always use strong calls-to-action like Please Follow or Please Share. Relevant content is THE currency in the social media universe. Only relevant and valuable content (help content or entertaining content) gets likes and shares. Considering that tons of content is published every day, your target audience has millions of options to choose from. Creating quality content that is highly relevant to your audience is the fundament for your social media marketing success. Share tips to make your customers’ lives easier. Visual content is more likely to get shares, likes, and comments than pure text messages. People remember visual information 65% longer than text information. So, visual content can generate additional reach and bring more traffic from search engines and social media to your website. Illustrate your posts with graphics, photos or infographics. Always share your social media posts with an image or as an image post. Image posts can have a huge influence on the reach and interaction with your posts. 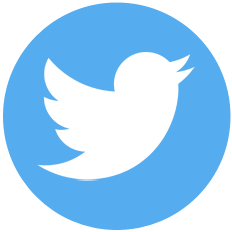 Also, image posts on Twitter, Facebook, and Google+ have the advantage that the images are automatically transferred to the image galleries and are thus permanently available in the social media profiles. Before you start creating new content for your social media communication, always consider re-purposing the content you have. To make the most of your content and your social media channels, re-purpose every single piece of content to create a multiple media portfolio. It will need less effort and resources for turning every single piece of content into several other media formats than creating new content. Each new media format can be cross-promoted on social media to catch as many eyeballs as possible for your content. Turn your key facts and images into a slideshow and share it on networks like Slideshare and Scribd. 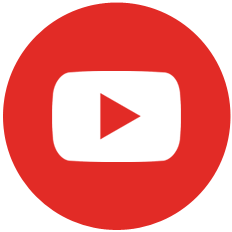 Screencast your slideshow into a short video clip with a link to your blog post and share it on YouTube and Vine. Add voice to your content and turn your blog posts and articles into podcasts. 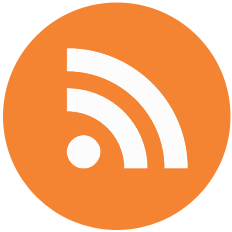 Add the podcast to your blog posts or articles for readers who prefer to listen rather than to read. Share your podcasts on sites such as iTunes, Google Play Music, Stitcher, and PocketCast. Turn your White Papers or e-Books into a series of short posts or guest posts and refer to them in every single post. 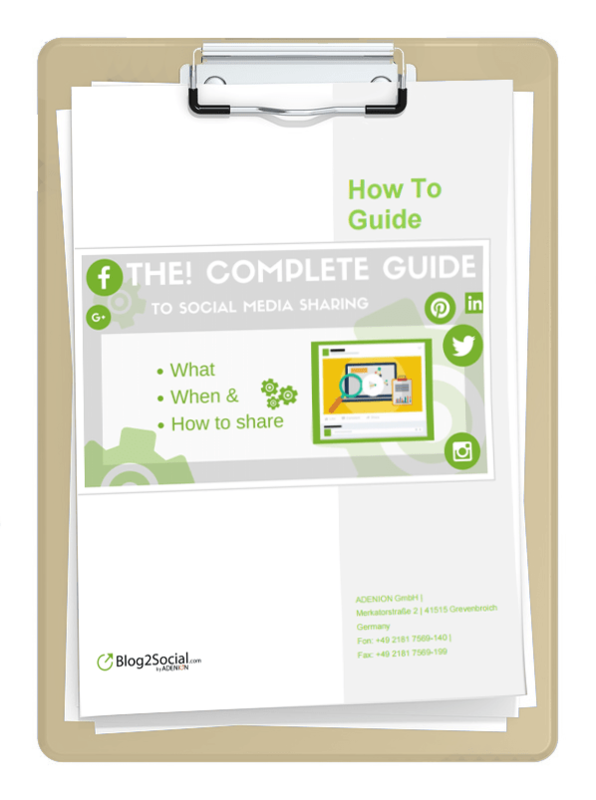 Write a downloadable Checklist for your post and share them. Create and share an Infographic with your post. 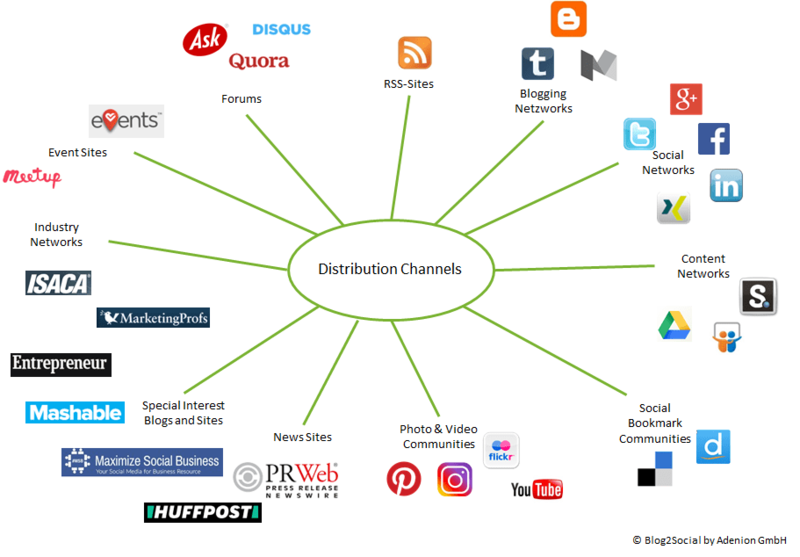 Re-share every single piece of content on your social media channels: Twitter, Facebook, Google+, LinkedIn, etc. Social media is a potent source to get more outreach for your content and to drive traffic to your business. 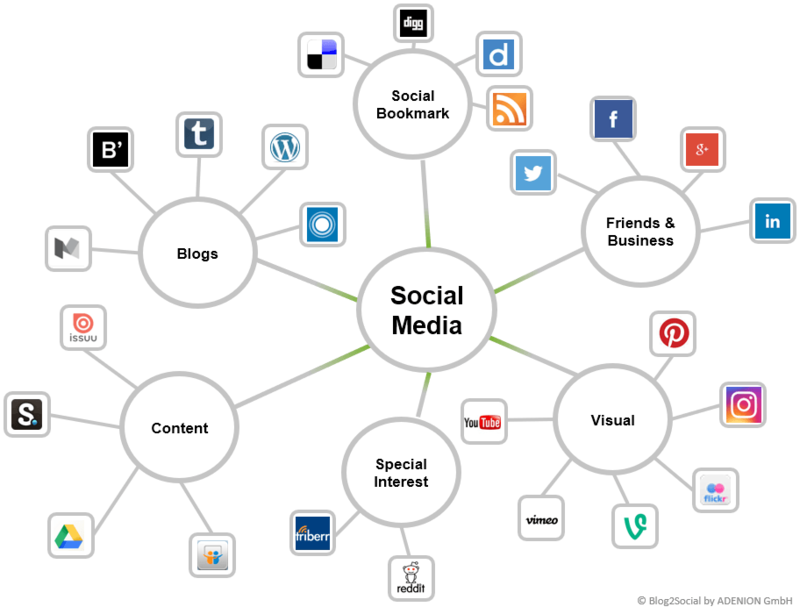 However, each social network offers different options for promoting your content. Each network is used for different purposes and at different times. And the communities react differently to post formats. The more content formats you have in place, the more content channels you can fill and the more eyeballs you can reach. Hashtags are essential parameters for linking your posts with current discussions (trending hashtags) or turning your social media posts into searchable content. But, hashtags don’t work equally well on all social networks. They are mandatory for Twitter and Instagram, they work well for Google+, but they perform less for LinkedIn and Facebook. A well-considered use of strategically chosen hashtags can have a significant impact on the visibility and reach of your social media posts. On some networks, you can also add @handles to reach out to specific users. Or, you can even add emojis to personalize your posts with emotions. You may also need to address your LinkedIn business contacts in a different way than your Facebook and Instagram followers. Share your content on Twitter, Facebook, Google+ and LinkedIn. If you have a business page on Facebook, LinkedIn, and Google+, share your posts on your pages as well but at different times and days. Also share your blog post with relevant groups and communities on Facebook, LinkedIn, and Google+, but also share them on different days and times and use different messages tailored for each group. Schedule your post multiple times on Twitter and on your LinkedIn timeline, but be more restrictive with Facebook and Google+. Share your blog posts as Google Posts on Google My Business. Also share a link to your blog post on social bookmark networks such as Diigo, Digg, and StumbleUpon. Use #hashtags, @handles or emojis wherever they apply to join trending discussions and keywords or to reach out to influencers. Syndicate your Content on LinkedIn Pulse, Medium, Tumblr, and Quora, but always make sure to re-publish your content a couple of days after you published the content on your blog. This allows the search engines to index your content first as original content. Whatever you do on social media, most of the time your followers will stay passive and you’ll need to nudge them into action. Wherever you post and whatever you post, always ask people to comment on your post, share their opinion or share your post. Sometimes you even need a strong call-to-action to prompt your readers to take action. Comment on your post and add a question to encourage your readers to comment on your post or discuss your topic. Also, add the question at the end of your post to remind your readers to share their opinion. Ask your readers to like your post, if it was helpful for them. Tell your readers, that you value their opinion. Ask your readers to share your post, if they like what they just read and they think it will help others as well. Encourage your readers to subscribe to your social channels. Social Media is all about sharing. And sharing your own content is a great way to get more outreach for your content. However, don’t use your social media channels for “self-promotion” only. Instead, connect with other people and relevant sources in your industry and share their posts as well. Interesting content from other authors, businesses or thought leaders in your industry can add value and authority to your own content and turn your social channels into valuable sources for your community. Curated content that might be interesting for your community also helps to make your social media channels more relevant as a useful resource for your audience. It also helps you to keep up with the pace of the Internet, without exhausting all of your resources on creating original content. Sharing fresh and highly relevant content shows that your business is always up to date with leading industry news and trends. Sharing content from top influencers and thought leaders in your industry also demonstrates that you value content from others. By showing your appreciation, you increase the chance that influencers will also share your posts. 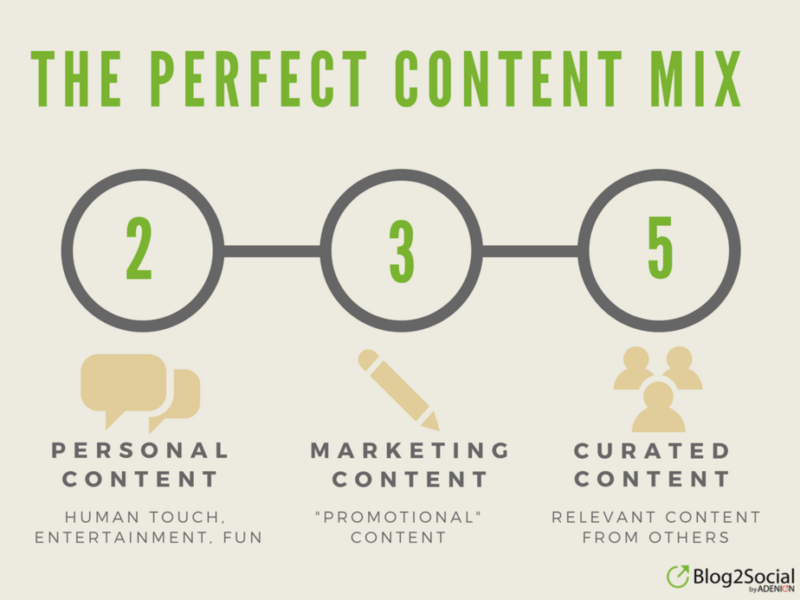 Follow the 2-3-5 rule for the perfect content mix: share 2 pieces of personal content, with 3 pieces of your relevant marketing content, and 5 pieces of curated content. Collect and filter relevant articles by major thought leaders and news channels in your industry that will be highly relevant for your audience. Make sure you select content that does not directly compete with but instead complements your own content. 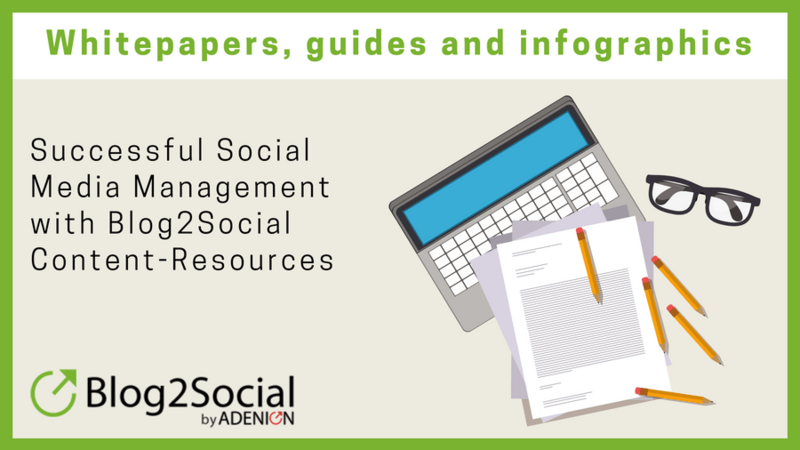 By informing the content sources about your activities, you’ll also get more attention for your content and channels. You can reach out directly to your content sources by adding @handles in the comments of your curated content. 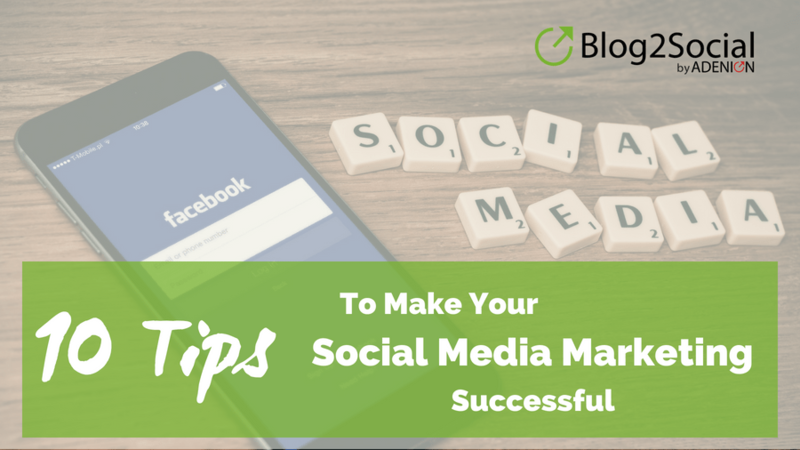 Your social media marketing efforts can devour a lot of time and resources trying to keep pace with social media communication. Social media automation is a great time-saver for those companies who need to post content on various social media channels. 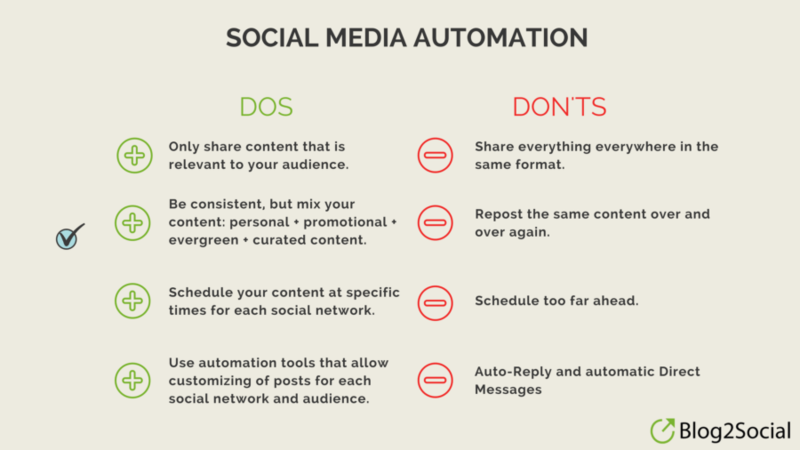 Automation saves time and ensures a consistent stream of content on your social channels. However, don’t let yourself be carried away by the convenience because social media automation can also turn your streams into lifeless, robotic streams of repetitive content. Don’t post the same content on all social channels, but always adapt your content and comments to the specific audience on each platform. Use social media automation tools that allow you to customize your messages for each of your social channels to encourage engagement. Use social media automation tools to schedule your content at different times and days across your social channels to target the best time for each audience and increase the lifetime of your posts. Re-post your evergreen content from time to time, but consider the frequency rules of each social channel and audience. Don’t schedule too far ahead in order to keep track of your scheduled posts and keep your content up to date. Don’t automate everything. Use automation to help you with routine work, but always respond and interact personally with your community. Watch your posts for comments and reply to each comment in time. Keeping track of your stats and social media marketing performance is crucial to get a better grasp of your audience’s preferences. This will make it easier to create content that performs best for your business. Try different campaigns and compare them afterward. For example, compare different types of content, different times and days for your postings. By analyzing the performance and conversions, you’ll get valuable information for your future social media activities. 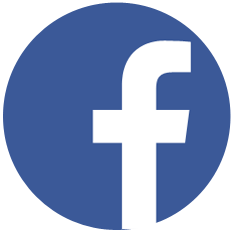 Your social media statistics are essential to see how many comments, likes and shares your posts receive. Whereas people are relaxed about giving a like, the share count shows they value your content enough to share it with their own community. Comments on your post show that they actively interact with your content. Analyze your blog and website stats for page views, page count, and reading time. Keep track of your blog and newsletter subscriptions plus leads for download material. Monitor your social media statistics for the number of followers and unfollowers, likes, shares, and comments. Social media success is all about content, community building, and engagement. If you listen to your social community you will get a better grasp on what they really care about. Sharing engaging content across all your social channels will help you to get more outreach and as many eyeballs for your content as possible. 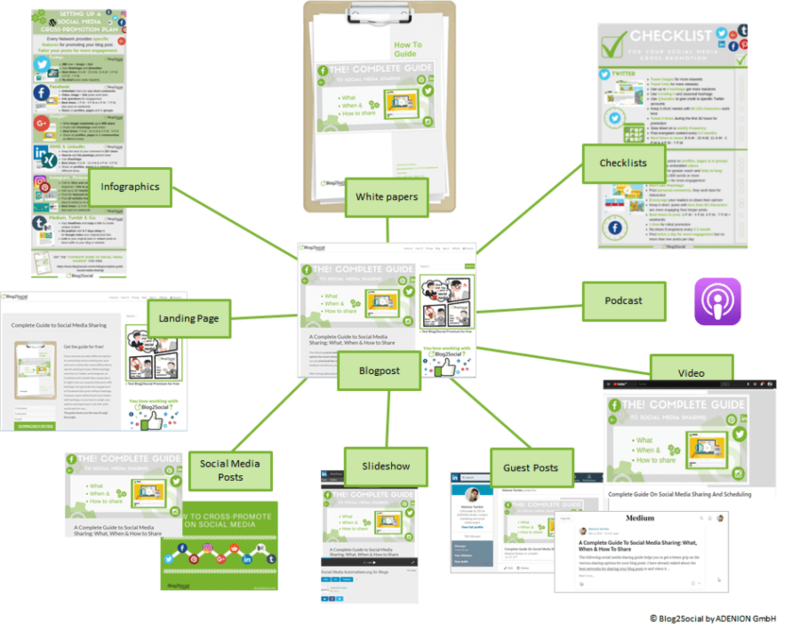 Re-purposing your evergreen content and re-sharing your best performing content will save effort and resources for creating new content. 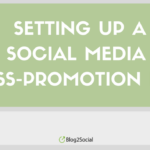 Setting up a social media cross-promotion plan with the help of smart social media automation tools will save even more time for scheduling and sharing your posts. A time you can better spend on engaging with your community. Hope to better my social media game using these tips. Thanks for stopping by and for your comment. We’re happy you liked the article. Social media is a remarkable marketing channel that can significantly skyrocket your business in a flash if used correctly. Many wonder how best to boost their businesses with social media, and here you have the answer. My takeaway is to use a string call to action and to engage your audience. A call to action is great because it helps you tell your target market what you want them to do with your content. And if your content is interesting, they will definitely share it with their follower, which will increase traction. Ranging with your audience is amazing as well because it enables you bring out, or find out the pain problems your audience are dealing with. The date will give you clues on how to create more engaging content. Hi Moss, thanks so much for your affirmative feedback. Great to hear, that you find my article helpful. I look forward to exchange more ideas with you. Have a great day.